We’ll embroider with a three-initial monogram at no additional cost. The order for this monogram is first name, last name, middle name. Order today and receive in 4 - 7 business days. Need it quicker? Contact us for rush options. Golf clubs? Check. Balls? Check. Beer? Check. 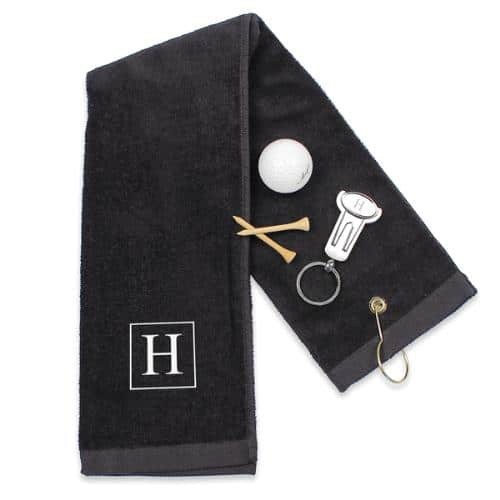 There’s just one other item that you’ll need before you hit the links: our Monogrammed Golf Towel! Featuring a red stitched monogram over crossing clubs and a perfectly mounted tee, it’s easy to see how the golfer on your shopping list will stay in style with this gift. Fashioned in 100% velour terry cloth, the towel comes complete with an absorbent design, grommet and hook. 25" long x 15 1/2" wide. 100% cotton sheared velour terry. Welcome to The Man Registry! Since 2008, we’ve been the go-to site for personalized, unique groomsmen gifts and wedding tips for men. We’re also proud to be the original groom’s gift registry. Sign-up for our mailing list.